You also know that there are plenty of other (often free) spots that offer as good – or better – views of the city from all directions, north, east, south, and west. Seattle, bordered by so many different bodies of water, has always been, in my mind, one of the prettiest cities in the world. If you want to feel omniscient and look down on the tiny little Seattilites, like watching a colony of ants, there’s no better place than the Columbia Tower Sky View Observatory. 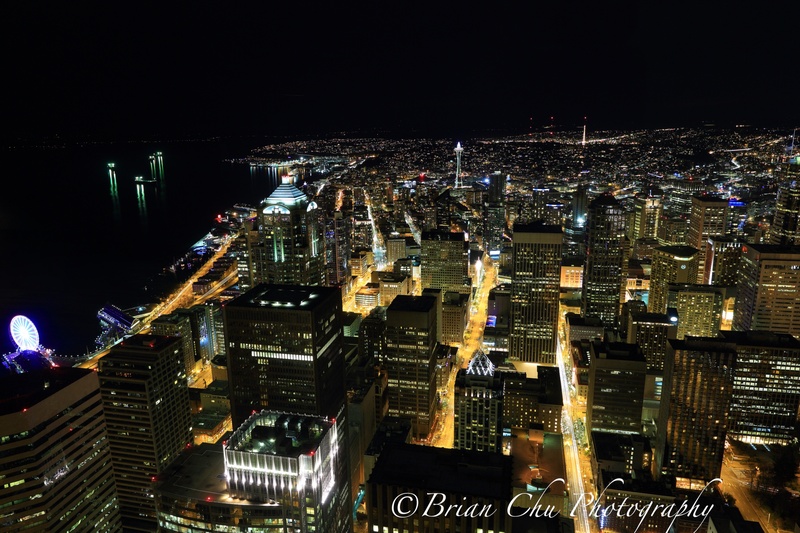 73 floors up in Seattle’s tallest building, it offers unparalleled 360 degree views of the city during the day and night. Especially at night. Best in the winter months, when the sun sets early, one can catch the sunset AND the beautiful city lights before the observatory closes at 8pm (in summer, you’ll never see the lights, as it’s still bright out until around 9pm). For photographers, there are even dark corners on the far sides of the room where you can take pictures, reflection free, from inside. Unlike the Space Needle, there is no outdoor viewing platform. On the flip side, there are no nasty wires in all of your photos, and plenty of space to set up tripods for long exposures. It’s a great trade off, in my opinion, not to mention warmer as well. And here’s the kicker – it’s only $12.50 to get in, versus $19 at the Needle. Need I say more?